Overlooking a valley and a 450-acre farm, Mountain Valley Brewing offers a perfect opportunity to enjoy the only hand-crafted beer in Henry County while strolling through the hopyard, touring the small brewery, chatting in the cozy taproom, listening to live music outside under the pavilion, or playing yard games while enjoying the beautiful views. The story of Mountain Valley Brewing naturally began with a farm. It all started when a job change moved owners Peggy Donivan and Herb Atwell from a comfortable suburban neighborhood outside of Richmond to rural Henry County. They found themselves settled in a quaint home on ten acres of land just as the craft beer industry began to boom in Virginia. MVB came to life when they realized there were few choices for those wanting to head out after work or on the weekend and drink a good craft beer. There were no breweries in Henry County and just one in nearby Danville. As they continued to brew and become more involved with the Train Wreck Homebrew Club, it became clear they could brew up some mighty tasty beer that people really enjoyed. After starting their own hopyard in 2014, Peggy and Herb asked themselves why not start a little farm brewery? Add in their supply of untreated natural well water and a love for great beer and everything else fell into place. Fresh hops are rarely found in craft beer except for the seasonal brews in the fall, and those are still fairly difficult to find in Virginia. With their own hop farm, the Atwells can keep fresh hops year-round. 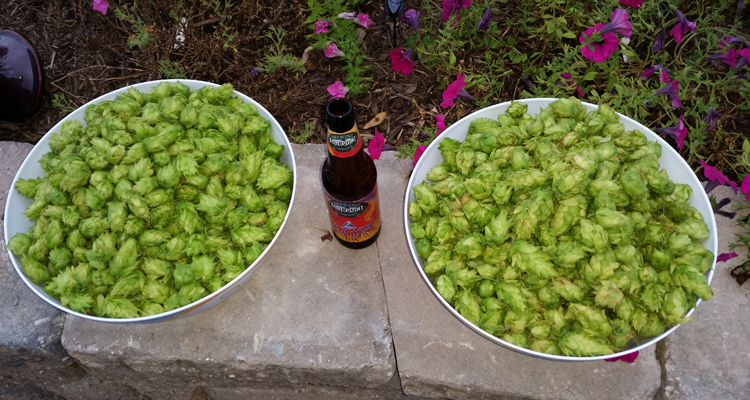 When they say they “grow beer,” they mean it. Walk into any grocery store and you’ll usually find a decent selection of craft beer. What won’t you find? MVB beer. That’s because MVB doesn’t distribute, bottle or can. Instead, it focus its efforts on providing unique, delicious beer you can’t get anywhere else. MVB uses fresh hops and turns to local farmers for raw ingredients like honey, fruit, grain and barley for fresh varieties of brews. MVB is considered a limited farm brewery, producing around 100 barrels per year in its 1.5-barrel homemade brewing system. Though you must visit the taproom to try the beer, MVB would love to let you fill up a growler to take a Mountain Valley brew with you wherever you go. Peggy and Herb hope to continue “growing craft” for years to come. Mountain Valley Brewing tries to offer a variety of styles so that even those that don’t like craft beer will find something to sip on. The brewery has several beers now that are customer favorites, with nine beers on tap. The Vulture Roost pale ale is MVB’s go-to beer as an introduction to those more accustomed to domestic favorites. Mountain Valley Brewing is kid and dog friendly, and its goal is to be the brewery where you feel comfortable bringing grandma, the new baby, and Fido with you to enjoy the views and relax. The brewery has become a meeting place for locals. The friendly atmosphere ensures that strangers don’t stay strangers long. MVB is also available as a special event venue for gatherings and activities of all kinds. Want to get married on the hop farm? They’ve done it. Call Peggy and Herb to see what they can do to help you plan your big day. Weekends are usually filled with live music by local, regional and even national artists. As a bonus, dinner is often offered from local and regional food trucks. If there isn’t a live performance scheduled on Fridays or Saturdays, there will still be entertainment including events like the popular “Sip ‘N Spin Vinyl Night.” Bring your favorite vinyl albums and sip and spin the evening away with great music, beer and food. 2018 has been and will continue to be a big year for the brewery. Mountain Valley Brewing is working with 2 Witches Winery & Brewing Company to supply the beer for the annual Smith River Fest being held on August 11th at the Smith River Sports Complex, and MVB is working with Piedmont Arts and the United Way of Martinsville-Henry County for several other special events. Mountain Valley Brewing is passionate about supporting other small businesses in the area as well as local clubs, charities, and non-profits. Follow Mountain Valley Brewing on Facebook for more upcoming events and to learn more about the beers on tap.